Welcoming In The New Year! We have never had a New Year’s Eve Party. The most we ever did was invite another couple over for dinner. Since 1981 we have been going on and off– mostly on–to a friend’s party where we always have a great time. This year, however, another friend called Michele and invited himself to our house for New Year’s Eve. We were going to be with him at Bern’s Steak House in Tampa the night before and I guess he figured why not make the party last longer. Not only was it New Year’s Eve, but it was also his birthday. Michele could not turn him down so she invited the whole group of friends who would be with us in Tampa to come for dinner. It turned out to be a perfect New Year’s Eve with great food, wine and dear friends. Since we were welcoming in the New Year we had four Champagnes. 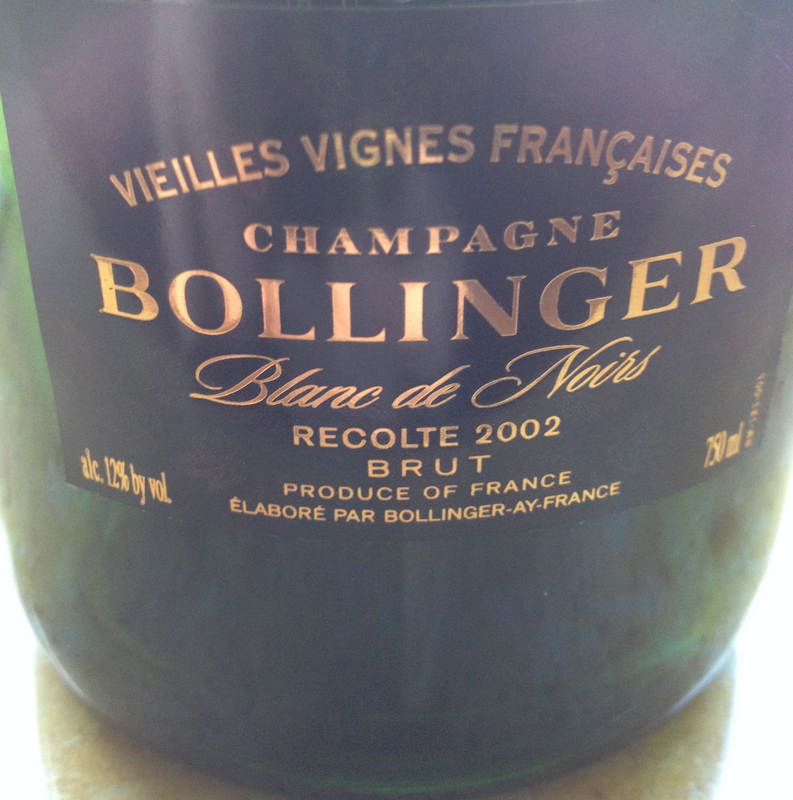 Bollinger Vieilles Vignes Françaises Blanc de Noirs Recolte Brut 2002 100% Pinot Noir. The grapes come from plots owned by Bollinger that were not attacked by phylloxera in the Grand Crus of Chaudes Temes and Clos St. Jacques in Ay and Croix Rough in Bouzy. These three plots are maintained traditionally following the provignace method (burying a branch which is separated from the parent vine once it has taken root) and worked by hand with the help sometimes of a horse cart. 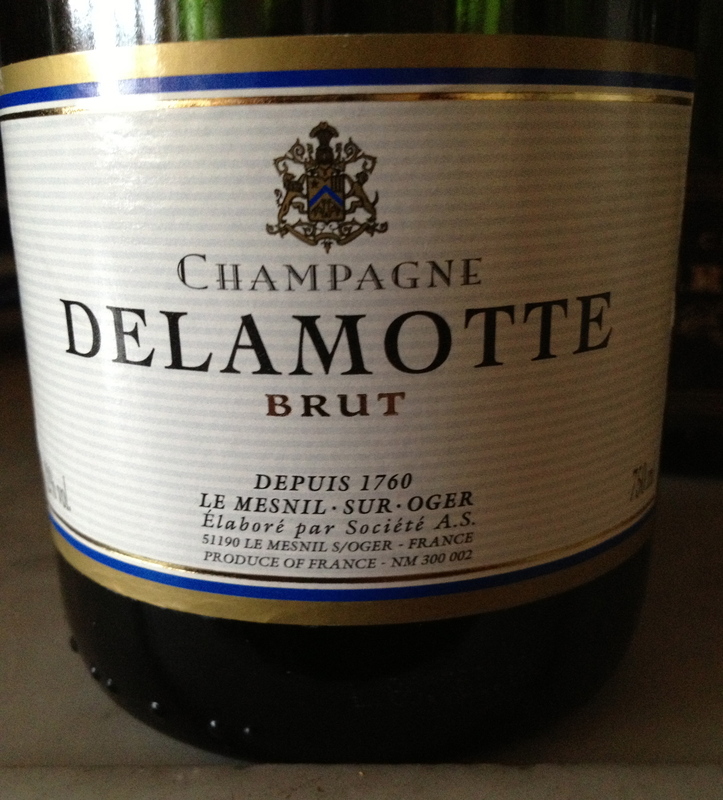 This is a great Champagne – one that gets your attention and you drink very slowly. 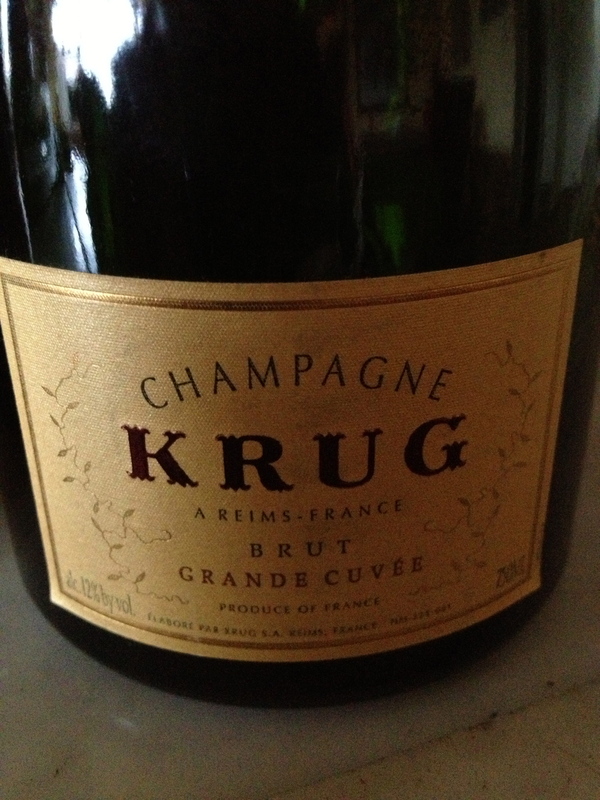 Krug Brut Grande Cuvée Made from Pinot Noir, Pinot Meunier and Chardonnay– the percent depends upon the vintage. They blend about 120 wines from 10 or more different vintages and it is aged for at least 6 years in the cellars. All of their Champagnes are aged in used small oak barrels. They are all prestige cuvees- -made from Grand Cru and Premier Cru villages and are aged longer before release. The overall rating for the vineyards is 98% with Krug’s own vineyards rating 100%. This is the wine we drank at midnight to ring in the New Year. 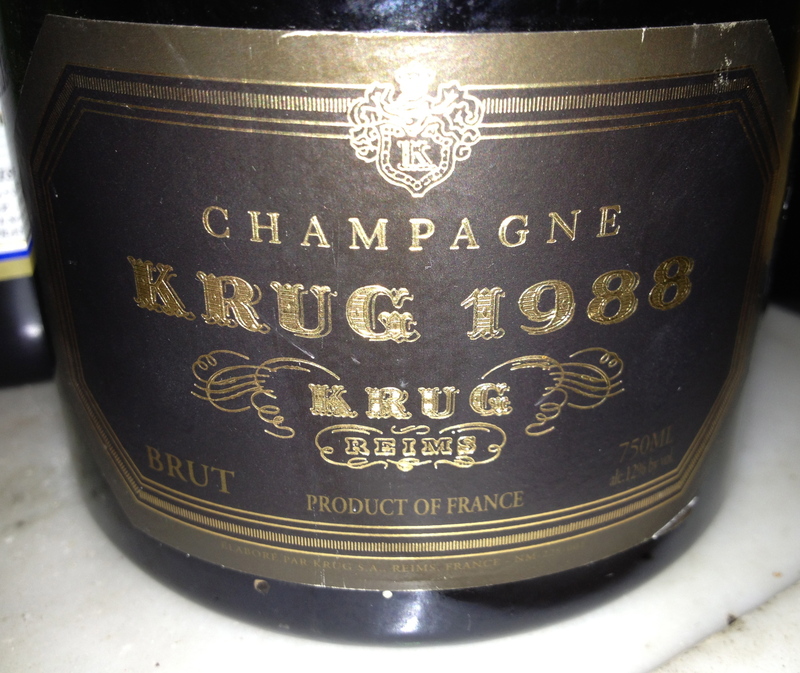 Krug Brut 1988 It is aged 10 years before release. What can I say about Krug but that it is Krug! Harvesting is by hand, sorting in the vineyard and again in the winery if necessary. Maceration and vinification take 2 to 3 weeks with the use of indigenous yeast and temperature controlled fermentation. Pigeage-pumping down of the must during fermentation tales place once a day until one half of the fermentation is complete. Then remontage- pumping over takes place until fermentation is complete. The wine is aged in French oak, mostly Troncay, 20% new barrels between 14 to 18 months. The barrels are weathered for 3 years before they are used. A fining collage is done to clarify the wine after a careful tasting. 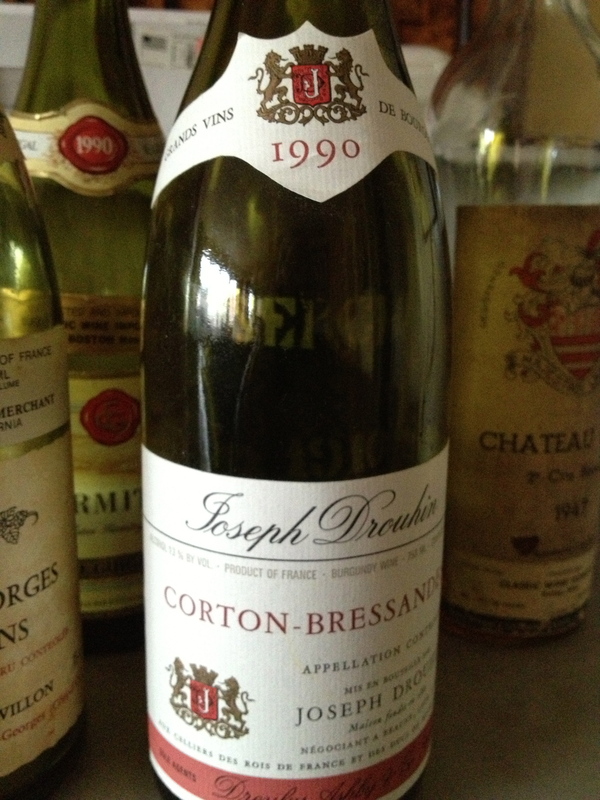 This could not have been showing better -great Burgundy. Nuits-Saint- Georges Les Vaucrains (infertile land) 1980 Robert Chevillon The vineyard exposure is East by Northeast and the altitude is 206/280 meters with a grade of 15%. They are old vines, the vineyard is 1.6h and the harvest is by hand. The soil is regularly plowed and the vines are only treated when necessary. Once the grapes have been harvested, destemmed and vatted, they remain in the vat 5 to 6 days during the cold maceration process, fermentation starts naturally. There is a long slow fermentation. Primary fermentation is in stainless steel cuvees and then the wine is racked into the barrel. It is aged in oak barrels of which 20% are new for about 16 months. The wine is bottled by gravity. This was a very interesting wine with nice fruit and a hint of blackberry. This is a producer that I have very little experience with but after tasting this wine I will try to correct this in the New Year. Hermitage 1990 E. Guigal 100% Syrah old vines. The soil is limestone gravel and sand. At the time Guigal did not own vineyards but purchased wine that had been vinified by growers according to the Guigal method. Robert M. Parker Jr in his book The Wines of the Rhone Valley and Provence states: “Guigal does not fine the wine and will not filter it.” The wine is aged 3 to 3 1|2 in wooden barrels and large foundres. Parker goes on to say “He (Guigal) is a great believer in long wood aging and is always the last to bottle his Hermitage. On the Guigal 1980 Hermitage Parker says “ Giugal bottled two separate lots of the red Hermitage in 1980. One is good- deep in color, spice and rich in fruit though somewhat short finish. The other lot is more austere, tart, and surprising lean. There is no way of telling the difference between them before pulling the cork”. Parker’s rating for this wine is a” ?”. I guess we were lucky because the bottle we drank had good fruit with a hint of spice, long finish, and nice aftertaste and was not showing its age. 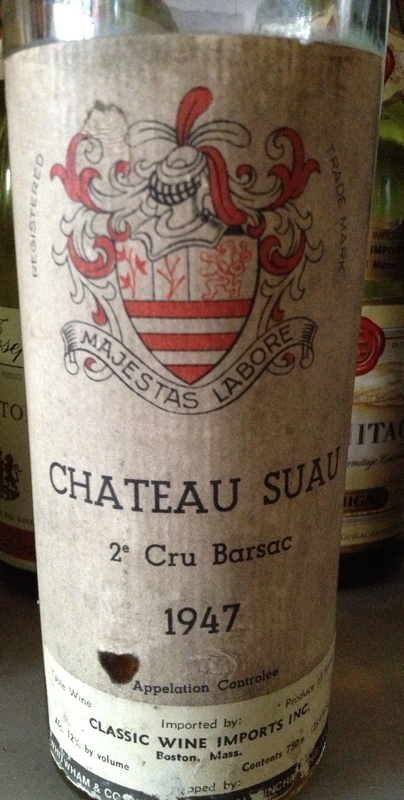 Barsac Chateau Suau 2 Cru 1947 – I believe the grapes are 80% Sêmillon, 10% Sauvignon Blanc and 10% Muscadelle. It was still drinking but really showing its age. 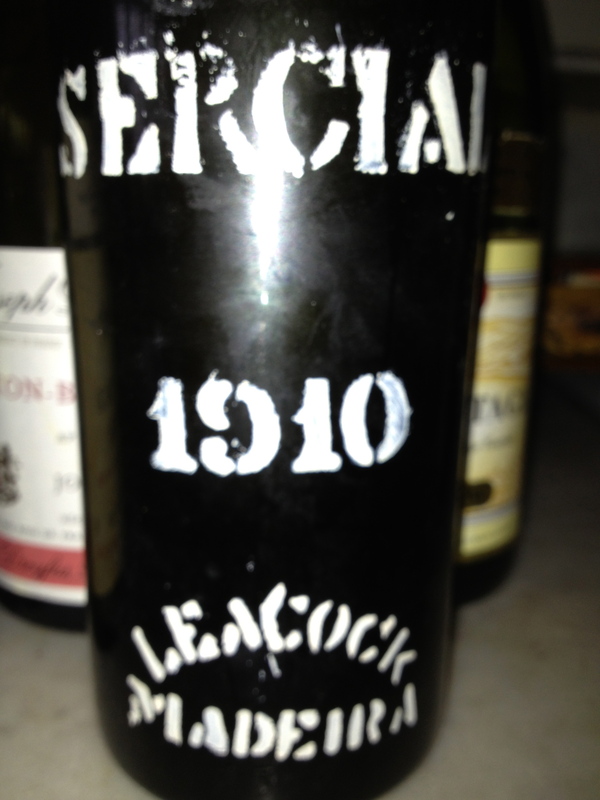 Madeira Sercial 1910 Leacock Made from the Sercial grape. Sercial Maderia is the driest of the four classic varieties of Madeira. It is also the lightest and most acidic and delicate expression of Madeira and takes the longest to mature. Maderia Sercial is a white fortified wine made on the volcanic island of Madeira, which belongs to Portugal. I just sat there and drank this wine into the New Year. We are back on I-Italy|TV: This Saturday at 11:00 PM repeated Sunday at 1:00 PM. got here up, it looks great. I have bookmarked it in my google bookmarks. I’ll appreciate if you proceed this in future. A lot of other folks will probably be benefited from your writing. Cheers!